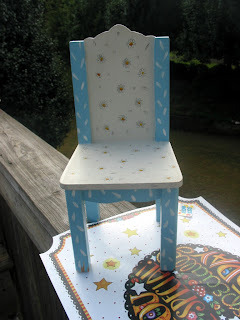 Last week I found this little chair at Goodwill for $3.93. I liked the shape, but not so much the paint job! So out came the 96 cent Walmart spray paint. I wasn't happy with it being plain old white though. There were a few sprays of my satin nickle spray left in the can, so I spritzed that randomly on top of the white. 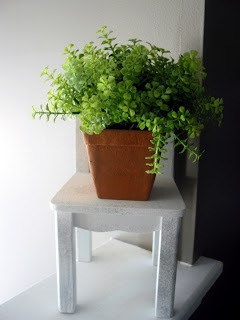 It looks really cute on the ledge above the foyer staircase, so I added a little plant from Michael's for now. 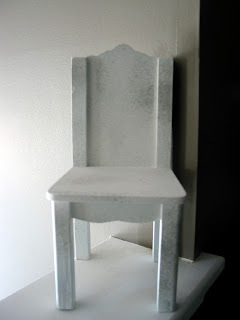 I may add a candle instead, not really sure - I just really loved this chair! What do you think of the finished project? What other items could I display on it? I am looking forward to getting some good ideas from y'all for this!! Easy Dinner Ideas when you are short on time! Looking for 11 6 new followers!! I'm on a roll tonight!! I love Black Spray Paint! Just found out I'm a TOH Field Editor!